Most of the people out there are not really a huge fan of recycle bin. Once they discover shift + del button, they do not let a single file to reach there. Also, with advent of data recovery software, the whole hard drive act as a recycle bin. If you have not permanently deleted files, you can always recover them. They see it as an useless feature and they don’t want to see this icon on their desktop. In windows vista it was very easy to just right click and delete recycle bin , but newer version of windows and specially windows 10 have made it slightly difficult to get rid of recycle bin. In this article i will show you how to to hide recycle bin in windows 10. Step 1– Go to your dektop and right click anywhere to make a menu appear on the screen. In the menu which just appeared, just click on the personalize. Step 2 – Now the personalization setting window will come out. In this window, first click on themes in the left menu. Then, click on the Desktop icon settings in the right side of the window as shown. 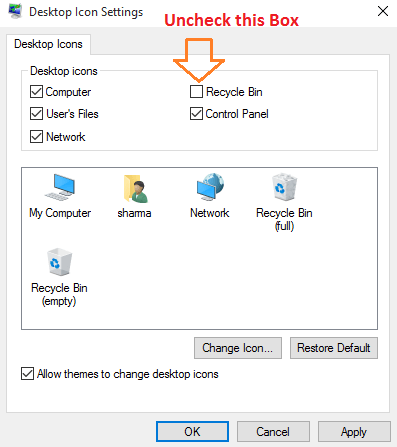 Step 3 – Now in the dektop icon settings menu box which just came out, just uncheck the recycle bin option. Thats all. Now, the recycle bin will be no more shown on desktop. It will be hidden from your view always. To unhide the recycle bin just check the option again. 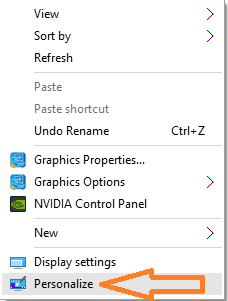 For getting the recycle Bin back to your desktop, just repeat the steps stated above and check the option to show recycle bin.